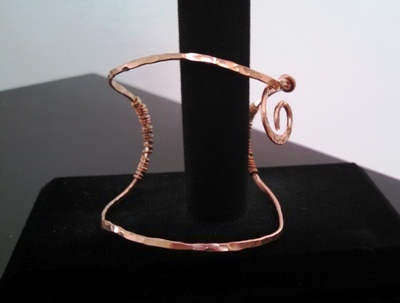 This 2014 holiday season, I’ve added new works featuring hammered and wrapped copper cuffs for the Mclean County Arts Center’s Holiday Treasures show. The arts center is located at 601 N. East Street, Bloomington, IL; phone 309.829.0011. Please check back for news of more new works for the holidays and an upcoming open house or join my mailing list by “following” me in the right upper column on the home page.